So with this hot weather we’ve been wanting lots of ice cream. With both Robin and now me as well being sensitive to dairy (it seems the baby is taking after him; I’m hoping that once it’s out normal service will be resumed), this is a little tricky. I’ve been experimenting with some ideas that don’t involve too much work. Pour fruit juice into an ice cube tray. Put in freezer. After about an hour, stick lolly sticks into the slush. After two more hours, you have mini ice lollies. A proper ‘ice cream’ with a good eggy richness. Very nutritious with all that egg and coconut, a good energy boost, and SCD-friendly too. I think this one’s my favourite, but it is the most work. Split the vanilla pod and scoop out the seeds. Heat the coconut milk and coconut oil with the vanilla pod and seeds until just boiling. Meanwhile, whisk the eggs and egg yolks with the honey in a large mixing bowl. Add a small amount of the hot coconut milk to the egg mix and whisk in. Whisk in the rest of the coconut milk gradually. Return to the pan and heat slowly until it thickens, trying not to cook the eggs too fast. When it’s cold, extract the vanilla pod, turn the mix into an ice cream maker and churn until thick. Just before you turn it off, add the desiccated coconut and let it churn in. Pot up and freeze. It should nicely fill a 1-litre tub. I made it first with 80g of honey and I rather liked it that way, but Robin reckoned it was not nearly sweet enough. So for the second batch I’ve near-doubled the honey content, which should make it sweet enough for normal tastes. You could probably use this as a base for other flavours, for example adding cocoa powder or chocolate chips, strawberries, or other nommy things instead of the desiccated coconut. Oh look, you have four egg whites over. Here’s what to do with them. Blend the berries and sugar into a slurry. You’ll need a jug blender if you have one – the berries leap everywhere if you try using a stick blender in a bowl. I don’t have a jug blender, and ended up bashing the berries with a pestle until they were soft enough to use the blender on. Whisk the egg whites until they do the soft peak thing. Stir a couple of tablespoons of the egg white into the berry paste, and then gently fold in the rest. Turn into an ice cream maker and churn until thick. This won’t take long, as it should still be substantially frozen. Pot up and freeze. Again, this should fit nicely in a 1-litre tub. You should be able to substitute other fruit for the berries. Perhaps lemon or mango? This is based on this recipe. All I changed was that I used a large scoop to get proper-sized ice lollies rather than mini ones, and mixed the nuts into the chocolate rather than faff about adding them separately. It takes a couple of days, but not a lot of actual work, and it’s well worth it. Peel and chop the bananas, and freeze overnight. 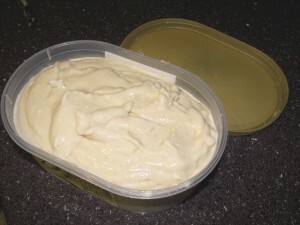 Next day, blend the frozen chopped bananas into a paste, and put back in the freezer. Wait at least two hours. Insert lolly sticks and freeze overnight again. Chop the nuts coarsely in a mini food processor. If using almonds, toast them by baking in the oven at 180º for about four minutes. Melt the chocolate and coconut oil together, then leave to cool back to a warm room temperature. Stir in the nuts. Take the banana balls out of the freezer and coat them in the chocolate nut mix. Return to the freezer. You don’t need to wait long before they’re ready to eat! 5 Responses to "Dairy-free frozen sweet things"
If I had the time I would make/adapt some of these for Kevin. Probably need to get a new battery for my ice cream maker first. The coconut one is Kevin-safe as is. The banana centres of the banana choc ices are fine too, if the bananas are very ripe, though the chocolate coating isn’t safe. The sorbet would work too if you replace the sugar with honey, or omit it altogether for something a little less sweet. 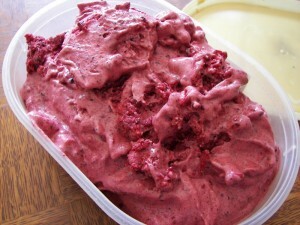 You can also mix your frozen bananas half and half with frozen other fruit of your choice (or whatever you happen to have in your freezer), and then work them together in a food processor until they come together – you can add a little orange or other fruit juice to speed this process, but you don’t have to! I like your coconut ice-cream recipe; do you toast the coconut first? That can add an interesting depth the recipe I use is a little simpler than yours, but involves evaporated milk as well as coconut milk, which you won’t want). I like to add some frozen raspberries and/or raspberry coulis to the ice cream; the combination of raspberries and coconut is incredibly pleasing! I hadn’t thought of toasting the coconut, but I might give that a go! I haven’t tried adding raspberries (only just coming into season up here) but we did have some with cherries on top and that worked really well.